The Assignment: Have fun with rules applied to scales, in coordination with the Algorithmic Art Assembly. Deadline: This project’s deadline is Monday, March 25, 2019, at 11:59pm (that is, just before midnight) wherever you are. It was posted in the early evening, California time, on Thursday, March 21, 2019. This week’s project is being done with the Algorithmic Art Assembly, “a brand new two day conference and music festival, showcasing a diverse range of artists who are using algorithmic tools and processes in their works.” It’s being held in San Francisco on March 22 and 23, 2019. More information at aaassembly.org. The project is lightly adapted from one proposed by Junto member Charlie Kramer (aka NorthWoods). Step 1: Define a scale of 8 notes (or sounds). Step 2: Create a melody with 4 notes from the scale resulting from Step 1. Step 3: Replace note 2 in the melodic sequence from Step 2 with an unused note (selected deterministically or randomly). Then do this for note 4, then for note 3, and then for note 1. Step 4: Reintroduce the first melody as counterpoint to the result of Step 3. This establishes a pair of notes at each point in time. Step 5: Repeat the algorithm on these pairs. Repeat to create triplets. Step 6: Sequence variations to create a piece of music. Extra credit: Do the same with note durations and velocities (e.g., 8 possibilities, 4 choices). Step 1: Include “disquiet0377” (no spaces or quotation marks) in the name of your track. Step 2: If your audio-hosting platform allows for tags, be sure to also include the project tag “disquiet0377” (no spaces or quotation marks). If you’re posting on SoundCloud in particular, this is essential to subsequent location of tracks for the creation a project playlist. Deadline: This project’s deadline is Monday, March 25, 2019, at 11:59pm (that is, just before midnight) wherever you are on. It was posted in the early evening, California time, on Thursday, March 21, 2019. Title/Tag: When posting your track, please include “disquiet0377” in the title of the track, and where applicable (on SoundCloud, for example) as a tag. The project is lightly adapted from one proposed by Junto member Charlie Kramer (aka NorthWoods). Image associated with this project is from the graphics for the Algorithmic Art Assembly, “a brand new two day conference and music festival, showcasing a diverse range of artists who are using algorithmic tools and processes in their works.” It’s being held in San Francisco on March 22 and 23, 2019. More information at aaassembly.org. The Assignment: Celebrate Pi Day. Deadline: This project’s deadline is Monday, March 18, 2019, at 11:59pm (that is, just before midnight) wherever you are on. It was posted shortly before noon, California time, on Thursday, March 14, 2019. 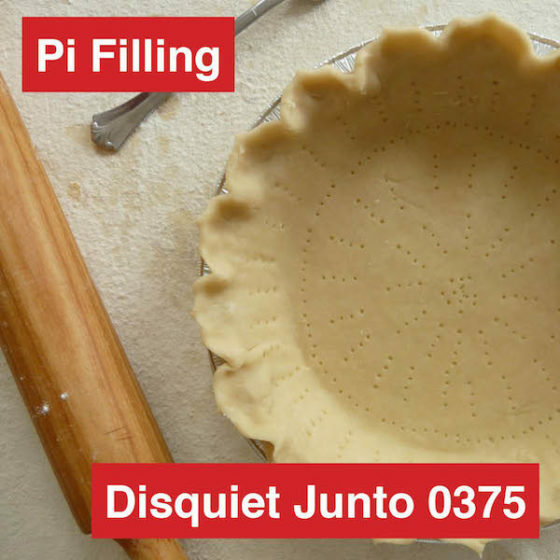 Step 1: There is only one step for this project: Make music by applying pi (3.14159…) in celebration of Pi Day, March 14, 2019. 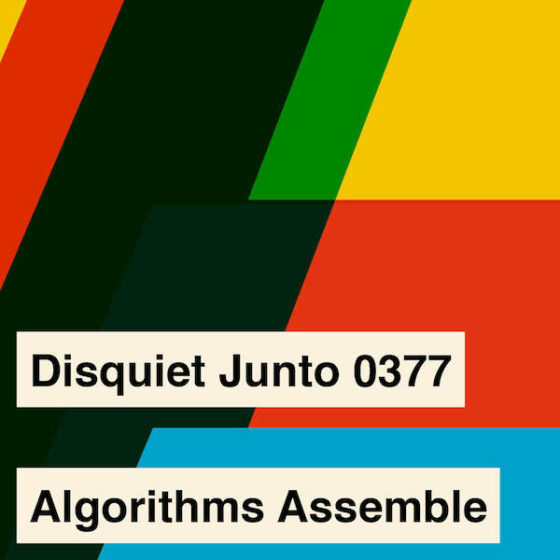 Step 1: Include “disquiet0376” (no spaces or quotation marks) in the name of your track. Step 2: If your audio-hosting platform allows for tags, be sure to also include the project tag “disquiet0376” (no spaces or quotation marks). If you’re posting on SoundCloud in particular, this is essential to subsequent location of tracks for the creation a project playlist. Title/Tag: When posting your track, please include “disquiet0376” in the title of the track, and where applicable (on SoundCloud, for example) as a tag. This is a quick, initial attempt on my part with a new piece of software called Ultomaton. The name is a play on the word “automaton” because the software employs Conway’s Game of Life, the famed “cellular automation” simulation, as a source of triggers and other controls, such as volume and place in the stereo spectrum, for all manner of sonic processes. 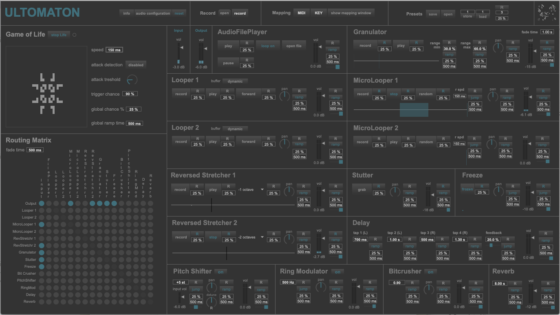 These effects include stutter, backwards audio, looping, and granular synthesis, several of which are heard in this test run. What I’m playing on electric guitar as the source audio is the first of the 120 right-hand exercises by composer Mauro Giuliani (1781 – 1829). I’ve been working my way through these exercises for the past few weeks, and sometimes experimenting with ways to make practice even more enjoyable, such as prerecording the chords to supply accompaniment. The real-time processing of Ultomaton provides accompaniment as I play, built from the very things I am playing at that moment. The accompanying screenshot shows the Ultomaton controls as they were set for this recording. The electric guitar went into the laptop, a Macbook Air (2013), via a Scarlett audio interface. After recorded, the audio was cleaned up in Adobe Audition: volume increased, bit of reverb added, and fade-in/fade-out implemented. Track originally posted at soundcloud.com/disquiet. The Ultomaton software is the work of Benjamin Van Esser, who is based in Brussels, Belgium. The software is free at github.com/benjaminvanesser. More information at benjaminvanesser.be. The Assignment: Make a piece of music that sounds as unlike you as you can accomplish. Deadline: This project’s deadline is Monday, March 11, 2019, at 11:59pm (that is, just before midnight) wherever you are on. It was posted shortly before noon, California time, on Thursday, March 7, 2019. Step 1: There is only one step for this project: Make a piece of music that sounds as unlike you as you can accomplish. 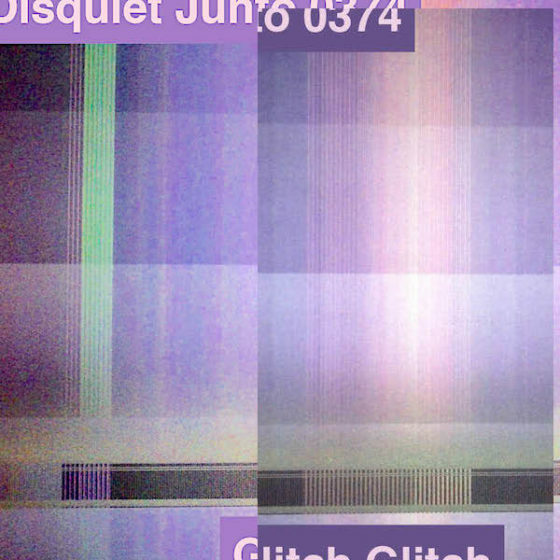 Step 1: Include “disquiet0375” (no spaces or quotation marks) in the name of your track. Step 2: If your audio-hosting platform allows for tags, be sure to also include the project tag “disquiet0375” (no spaces or quotation marks). If you’re posting on SoundCloud in particular, this is essential to subsequent location of tracks for the creation a project playlist. Title/Tag: When posting your track, please include “disquiet0375” in the title of the track, and where applicable (on SoundCloud, for example) as a tag. The Assignment: what happens when you glitch something that's been glitched? Deadline: This project’s deadline is Monday, March 4, 2019, at 11:59pm (that is, just before midnight) wherever you are on. It was posted in the afternoon, California time, on Thursday, February 28, 2019. The Assignment: what happens when you glitch something that’s been glitched? Step 1: Take a recording. Glitch it. Step 2: Glitch it a second time, in some different manner, and try to have moments where the initial glitch remains evident and untarnished (well, un-further-tarnished). Step 1: Include “disquiet0374” (no spaces or quotation marks) in the name of your track. Step 2: If your audio-hosting platform allows for tags, be sure to also include the project tag “disquiet0374” (no spaces or quotation marks). If you’re posting on SoundCloud in particular, this is essential to subsequent location of tracks for the creation a project playlist. Length: The length is up to you. Short is good. Title/Tag: When posting your track, please include “disquiet0374” in the title of the track, and where applicable (on SoundCloud, for example) as a tag.